This basketball games glossary is divided into 3 parts that includes an introduction and a learning games section for new basketball players and fans. Basketball Games Glossary is dedicated to passionate game players and fans that compete, watch this favorite of sport games, bet on basketball games and applaud basketball gamerisms. Basketball was invented in 1891 by Dr. James Naismith who was a professor at the YMCA. Two peach baskets were nailed to either end of the gymnasium, the object being to get the ball into the basket for your team. Basketball today is a team sport that pits two teams against each other with a goal or hoops on each end. Basketball is played on a court, typically made of wood, measuring 94 X 50 feet for the NBA=National Basketball Association. Five players representing each team take to the floor to play with up to ten basketball players on each bench. 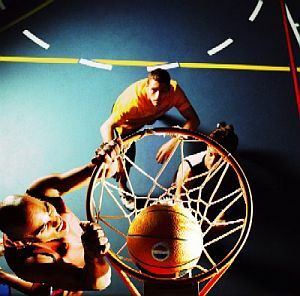 Basketball is the fastest growing sport in the world, mainly due to the simplistic nature of the game and the minimal and inexpensive equipment needed to play. The only equipment necessary to play is a ball and a hoop/basket. This Basketball Games Glossary will often refer to offense or defense within the definition. An explanation of these 2 terms follows. On offense, the person with the ball must dribble or pass the ball up the court without taking any steps while holding the ball stationary in hand. Goals can be scored in increments of one, two and three. Foul shots are worth 1 point on the scoreboard, field goals inside the three-point line=2 points and outside the three point boundary=3 points. On defense, the objective is to stop the offensive team from scoring by taking the ball away, thus changing possession. The defender must do this by stealing the ball from the dribbler or passer or by blocking a shot or attaining the ball from a rebound after a missed shot by the offense. The key to defense is to accomplish possession without touching the opposing player and impeding their progress. Otherwise, the offending player is charged with a foul. At the end of the game, after four quarters or two halves depending on the league, a winner is determined by highest points scored. In the instance of a tie, overtime periods are played until one team leads in scored points when time has expired. Airball: a shot that entirely misses the backboard, rim and net. 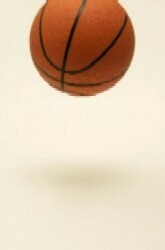 Alive: ball is up for grabs when set in motion by a shooter and/or during a jump ball. Alley Oop: occurs as the ball is high near the basket, the player grabs and scores in one smooth move. Assist: direct pass made from one player to another resulting in a score. Backboard: term for area, approx. 6 X 4 ft that secures the basket. Backcourt: the area of the court extending from half court to the baseline where the other team's basket is located. This area must be passed in order to score. Once crossed, a player must not reverse or cross back into this area, otherwise a violation is called. Backcourt Violation: time is up, if after 10 seconds, a player does not move the ball from the back to frontcourt. Backdoor Play: player moving up behind the defense and open to a pass. Ball Fake: tossing this way, no the other, a deke to trick an opponent. Ball Handler: refers to basketball player who is either in possession of the ball or moving the ball with skill. Bang the Boards: jargon for moving in on that rebound very forcefully. Bank Shot: a shot scored by banking the ball off the backboard into the basket. Baseline: two line markings that determine the court boundaries. Baseline Drive: term for an aggressive rush moving along the baseline to the basket. Basket or Bucket: the main focus of the game is 18 inches around to include net material. Beat the Defender: player moving skillfully beyond the cover shadowing him/her. Bench: basketball games glossary reference to the ladies and gents in waiting to get into the game. Blind Pass: not focused on the intended target, but here goes the pass. Blocked Shot: that shot is down before it reaches the basket. Blocking: a defender physically impeding the progress of an offensive player. Bonus Free Throw or Bonus Situation: after the personal fouls tally is over the limit, a freebie is given to the opposing team. Bounce Pass: one bounce is all it takes to get to your teammate. Box-and-chaser: term for a team strategy formation where 4 players are 'the box' and a fifth chases the ball. Boxout: a player positioning themselves between the goal and another player in order to secure the rebound from a missed shot. Brick: jargon for a lazy shot that deflects off the rim or backboard. Bunny or Bury: on the other hand, these terms refer to an easy score. Buzzer Beater: shot that is made on the right side of the buzzer signaling the end of period/game. Carry the ball: forwarding the ball without dribbling. Center: pick the tallest player to be the center of the offense—he/she do the tip offs and assist with offense. Center Circle: jump balls to start play occur here in this 12-foot circle. Center Line: marking point that divides the court into two, also referred to as the mid court line, ten-second line, and time line. Center Official: game official who monitors and calls the play between the free throw line and mid court mark. Charging: occurs when an offensive player initiates contact with a defensive player who has established position, resulting in an offensive foul. Charity Stripe: jargon for free throw line. Chest Pass: motion using 2 hands and passed from chest level. Clear-out: jargon for play strategy where 4 players are placed on one side of the free throw line leaving a fifth to play one-on-one against a defender. Coast to Coast: jargon for moving the entire court to score! Collapsing Defense: refers to players moving in on the center player of the other team. Convert: a free throw score---sweet! Cords: basketball games glossary term for basketball net. Corner: term for region close to the baseline and sideline. Cornerman: another name for a forward. Court: this is where the action is, the game playing area. Cripple: smooth playing score involving no opposition. Crossover: basketball games glossary term for quickly dribbling the ball from the right hand to the left hand or vice versa. Cut: rapid movement around a challenger or to a court opening. Cylinder: jargon for a part above the basket that is not attainable by players. Dead Ball: no play here, occurs after a whistle stop or a score requiring a re-start of play. Defensive Rebound: receiving the ball after a play by an opposing player. Deny the Ball: that challenger just lost possession of the ball. Diamond-and-one: strategic format where 4 players are 'the diamond' while a fifth goes up against a single defender. Double Double: occurs when any player achieves double-digit statistics in a single game, example=10 points and 10 rebounds. Double Dribble: dribbling the basketball with two hands at the same time or picking up the ball, coming to a stop, and beginning to dribble again. Double Foul: occurs when a foul is called against each of the team players resulting in a jump ball between these two specific players. Double Pump: basketball games glossary term for two quick fake shots in a row. Double Team: the use of two defenders to guard one offensive player. Downcourt: heading down to the basket. Downtown: way long shot from the three-point line. Dribble: action of moving the bouncing ball using 1 hand. Drive: forceful action to the basket while in possession of the ball. Drop Step: the flow of this motion is-- step back from a defender, turn and drive on past him/her. Dunk or Slam Dunk: the action of throwing the ball hard through the basket with one or two hands. If Basketball is your passion and you want more of a good thing, then we offer this games glossary in 3 parts.